Heilind is now stocking TE Connectivity's BUCHANAN WireMate Surface Mount TB Series connectors. Heilind Electronics, a leading global distributor of electronic components and authorized distributor for TE Connectivity (TE), a global leader in connectivity and sensors, has expanded its product offering with TE’s BUCHANAN WireMate Surface Mount TB Series connector. This two-piece pluggable solution is designed for customers seeking to switch from wave soldering to surface mount PCB processing. TE’s BUCHANAN WireMate TB Series connectors include low profile, surface mount headers and mating plugs in vertical and right-angle configurations for two to 12 poles. The connectors allow for faster PCB assembly, while optional SMT retention features help ensure secure PCB mounting. Additionally, the releasable contact function allows for convenience in installation and rework. The TB Series is also designed for durability. Contacts are constructed from tin-plated copper alloy and the housing material features a UL 94 V-0 flammability rating. This makes the connectors suitable for a wide range of applications including LED Lighting, HVAC controls, security systems and industrial controls. 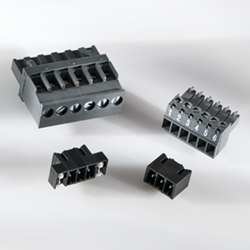 Visit Heilind’s website for more information about TE BUCHANAN WireMate TB Series Connectors. TE Connectivity Ltd. is a $13 billion global technology and manufacturing leader creating a safer, sustainable, productive and connected future. For more than 75 years, TE’s connectivity and sensor solutions, proven in the harshest environments, have enabled advancements in transportation, industrial applications, medical technology, energy, data communications and the home. With 78,000 employees, including more than 7,000 engineers, working alongside customers in nearly 150 countries, TE ensures that EVERY CONNECTION COUNTS. Learn more at http://www.te.com and on LinkedIn, Facebook, WeChat and Twitter. BUCHANAN WireMate ,TE Connectivity, TE and EVERY CONNECTION COUNTS are trademarks.